Phnom Penh (Cambodia) 12 December 2017 - “Protecting children from violence is essential if we are to realize the vision of the Sustainable Development Agenda of a world free from fear and violence for all children,” said Marta Santos Pais, Special Representative of the UN Secretary-General on Violence against Children (SRSG-VAC), in her keynote address to launch Cambodia’s first ever Action Plan to Prevent and Respond to Violence against Children. “The implementation of the Action Plan 2017-2021 provides a pathway for Cambodia to achieve this global goal, and it highlights the ASEAN commitment to end violence against children in the region,” continued SRSG-VAC Santos Pais. The Cambodia Action Plan was informed by a comprehensive data survey on violence against children, launched in 2014, and is a result of cross-sectoral cooperation involving all government departments, civil society organizations, religious leaders, and importantly, children, adolescents and young people themselves, with UNICEF support. · One in every two children in Cambodia report having experienced physical violence. · One in 20 people reported that they had experienced sexual violence before reaching the age of 18. · Child marriage prevalence is up to nearly 60 per cent in some regions in Cambodia. · Child marriage, child trafficking and child online sexual abuse are having detrimental effects on children. “Children are the future of our country. 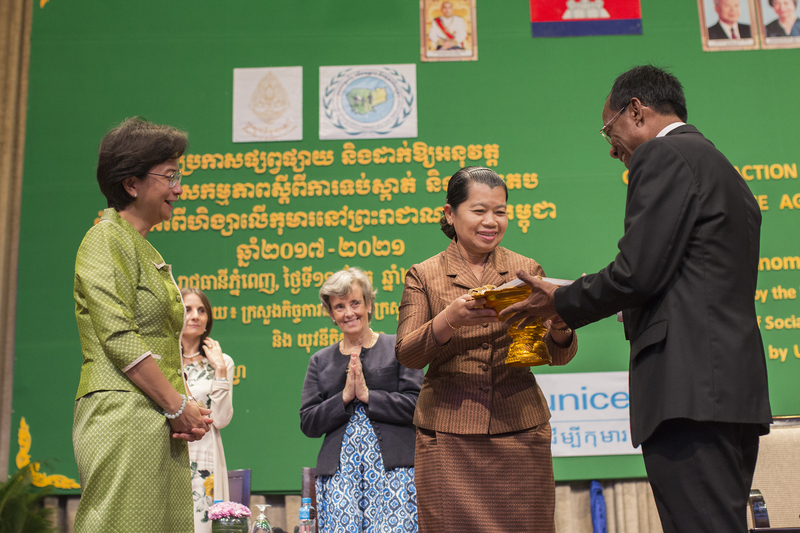 Fulfilling the rights of children to be protected from violence, abuse and exploitation is everybody’s responsibility,” said Her Excellency Men Sam An, Deputy Prime Minister of Cambodia, in her address at the launch. Cambodia’s Action Plan sets out roles and responsibilities, as well as activities to be carried out by various governmental agencies and non-governmental partners in several key areas, including health, social welfare, education, and, justice at the national, provincial, district and community levels. In addition to the involvement of children and young people in the process leading to the development of the Plan, civil society organizations were also actively involved and continue to play a key role in supporting a strengthened child protection system in Cambodia. NGOs help raise public awareness, support community work, extend services for children and consolidate violence prevention efforts. “I believe that to reach our overall goal to prevent and respond to violence against children in Cambodia, and to address all forms of violence and discrimination against children in line with the principles of the UN Convention on the Rights of the Child and other national and international legal frameworks, we must rely and depend on one another. No single individual, ministry, or sector can face this challenge alone,” noted His Excellency Vong Sauth, Minister of Social Affairs, Veterans and Youth Rehabilitation. The Action Plan will support efforts to develop and implement effective child-friendly strategies to prevent violence and improve services for both girls and boys who experience violence. Critical measures already adopted to advance progress include: a positive parenting strategic plan; a positive discipline teacher training module; a handbook for training health professionals; an action plan to reduce by 30 per cent the number of children in residential care; and, a new Juvenile Justice law that promotes diversion and the prevention of the deprivation of liberty of children. “Cambodia has collectively and effectively shaped an evidence-based Plan to guide action between now and 2021. It is urgent to move towards tangible implementation, including a credible and participatory process of monitoring and evaluation to keep up the momentum and assess progress along the way,” stressed SRSG-VAC Santos Pais. “Globally, violence against children is widespread, pervasive, hidden and socially accepted. It knows no cultural, gender or geographic borders, and is present in all contexts and in all countries. But evidence shows that violence against children is not a fate. It can be effectively prevented through strategic interventions such as those foreseen in Cambodia’s Action Plan to Prevent and Respond to Violence against Children,” concluded SRSG-VAC Santos Pais.